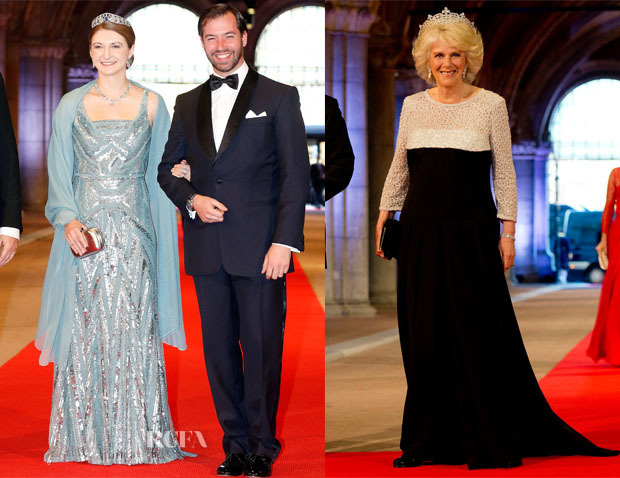 Many more royals took to the red carpet at Amsterdam’s Rijksmuseum for the dinner thrown by Queen Beatrix of the Netherlands to celebrate her abdication and her son’s investiture yesterday evening. Crown Princess Mary of Denmark: As always, my heart did flutter when I saw Mary on the red carpet. Looking nothing short of spectacular and every inch a modern princess, she wore a Birgit Hallstein gown, a designer she has worn a few times before. Her off-the-shoulder blush gown with an embellished bodice was accented with a satin waistband, with a Bottega Veneta clutch, Prada pumps and her wedding tiara completing her look. Princess Mette-Marit of Norway: While this gorgeous floral confection didn’t take to the runway, the pretty print is distinctive of the Giambattista Valli Spring 2013 collection. I really love the simplicity of this look, as much as the more showy gowns at this event. Even her tiara was slightly modest compared to the others. Crown Princess Stephanie of Luxembourg: Wearing an unmistakeable Elie Saab gown, Stephanie – whose wedding dress was designed by Mr Saab – blew me away wearing a fully embellished light-blue gown from the designer’s Pre-Fall 2012 collection with a chiffon scarf which, colour-wise, matched her gown. Camilla, Duchess of Cornwall: Camilla is not known for her fashion sense like the other royals, so I was delighted to see her looking beautiful on this occasion. She dazzled in a Bruce Oldfield monochrome gown topped off with a beautiful tiara – loaned by the Queen – which covered her voluminous ‘do. Princess Victoria of Sweden: As a huge fan of Elie Saab’s designs, most notably wearing several of his gowns during her wedding weekend, I was not surprised to see Victoria don the Lebanese designer again. Her purple gown may not have as much bling as the other attendees’, but she has a dazzling tiara, clutch and shoes for that. Princess Letizia of Spain: I kind of expected a bit more from Letizia. Of all the princesses at this event, her black embroidered lace gown is my least favourite. 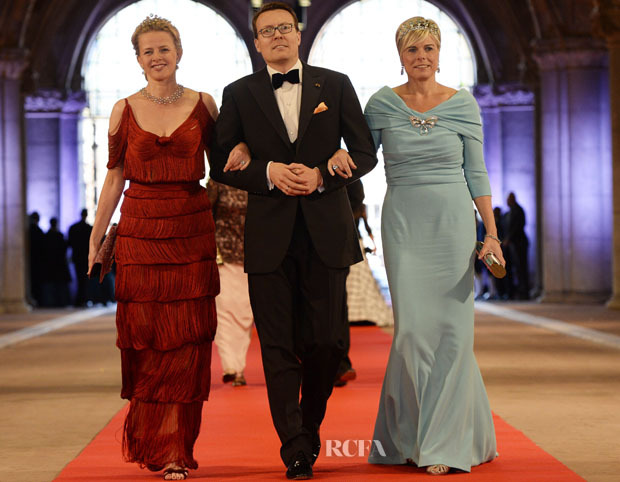 Princess Mabel of Orange-Nassau: Adding a touch of sass to the evening, Mabel donned a fully fringed Viktor & Rolf custom gown. The princess has been working with the design duo since they designed her wedding dress. She styled her look with a smaller version of the Mellerio Sapphire Tiara, which was her wedding tiara. Princess Laurentien of the Netherlands: While her sea-blue gown might seem more demure in comparison, for me it is more fitting to the occasion. I love the silver accessories and the colour, which brings out her eyes.